Possible trial width What's this? Enter an available DP size near the suggested size above. (Note: Other sizes are available, check with Manufacturer. Any size can be entered) Smaller sizes increase sump depth. For the purpose of calculation the catchment has been divided into two. Left hand side (LHS), and right hand side (RHS), It doesn't matter which is which, as long as all data is consistent within the side. That is, don't put a vertical face, or roof slope belonging to the LHS, into the RHS. It is not necessary to use both sides, or use vertical faces. However if the flow approaches the sump from two sides. LHS & RHS. The side with the maximum flow is used to size the box gutter. 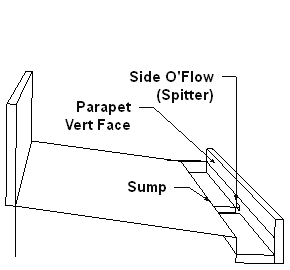 The total flow is used to size the sump and overflow. This free online box gutter calculator will calculate the size of box gutters, and sumps with a side overflow, in accordance with the Australian Plumbing Code AS/NZS 3500.3 .2003 Part 3 Storm Water Drainage. But it can be used for elsewhere in the world if you know the design rainfall intensity requirements for your area. For locations using to the International Plumbing code, or the Uniform Plumbing Code, as in the USA, the rainfall intensity required relates to a storm frequency of 100 years, with duration of one hour. The calculator is only suitable for draining to a sump with a side overflow. If draining to a rainwater head at the end of a box gutter use this calculator. or same thing but allowing for vertical faces use this one. If draining to a sump with a vertical overflow, somewhere along the box gutter use this calculator. The minimum width allowed for domestic projects is 200mm. For commercial projects the minimum allowable width is 300mm. Box gutters must be straight, (no bends). Must have a constant slope between 1:40 and 1:200. Minimum sump length is 400mm. The depth shown, of the box gutter, is the depth at the upstream end. The suggested down pipe diameter is shown for reference purposes only. This will give a sump depth about 150mm. Choose an available DP size (or any other size) and enter that for the calculation of the sump. Smaller sizes result in a deeper sump and larger sizes result in a shallower sump. If the sump length is calculated to be less than 400mm, the calculator will show 400, as this is the minimum allowable under the code. If the side overflow (spitter) length is greater than 450mm, the minimum allowable slope for the spitter is 1:10. The calculated depth allows for about 60mm freeboard. 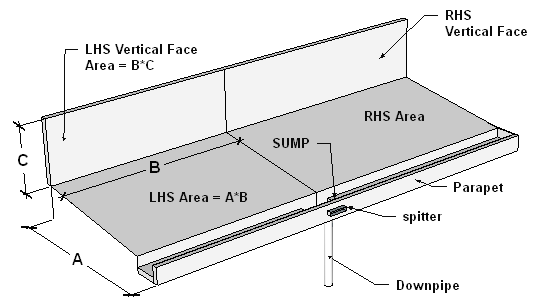 The box gutter depth, and the sump length, are influenced by the size of the overflow. A wider overflow needs less depth of overflow, hence the box gutter depth will also be reduced. However a wider overflow may increase the length of the sump. Making the box gutter wider will also reduce the box gutter depth. Making the down pipe larger will reduce the sump depth, but has no effect on the box gutter. However these calculators are based on hydraulic formulas, with parameters adjusted to give results consistent with the Code. They work for all flows up to the magical 16 L/s, so there is no reason to believe that they won't give satisfactory results above that flow. However just to be sure, results are checked with formulas from CSIRO. More explanation of this is explained in the results printout. Just bear in mind that if you use flows above 16 litres/sec you are beyond the scope of the Code. The total flow, catchment areas used, and worst wind direction will appear after you do a calculation. If you find that the programs save you time or money, please feel free to donate to a worthy cause (me).